Dreams are like letters from your Guardian Angel. Would you throw away such a precious bit of communication? And yet, most people do. But you may say, “I don’t dream.” Oh yes, you do! Dream research has proven everyone has a series of dreams twice in a 90 minute cycle. When you go to sleep, you drift down into the Alpha state as your brain waves lower from the Beta waves of 15 to 21 Cycles per second (your conscious mind) to the Alpha brain waves at 7 to 14 cycles per second. These dreams can be so real, you might wake and confuse them for reality, believing you had that experience but cannot quite remember when. When I took the time and effort to decipher the symbols in this dream, I gained a profound gift of wisdom. 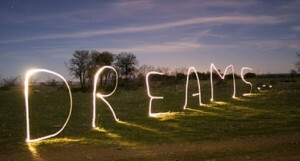 Interpreting dreams symbols is what I offer in this workshop. It will help you discover your fears and how to eliminate them. In the study of dreams, I was able to move from a debilitating marriage into a life of creativity, financial security and a partnership that brought me joy. In this six-hour workshop, you will be given methods for how to remember your dreams, as well as a unique way to record and interpret them to gain the profound messages they contain. Please bring a sack lunch and your own beverage as well as a Dream Notebook with alphabetized tabs to begin your personalized dream dictionary. You can schedule a personal conference with Betty Rae who with the help of her guide, the Archangel Raphael will decipher the symbols in your night visions. There is no judgment or “could’s” or “should’s” but only wisdom, humor, and unconditional love. You will need a notebook with alphabetized tabs to begin your personalized dream dictionary. Cost: $60 for one hour session either in person or via telephone.